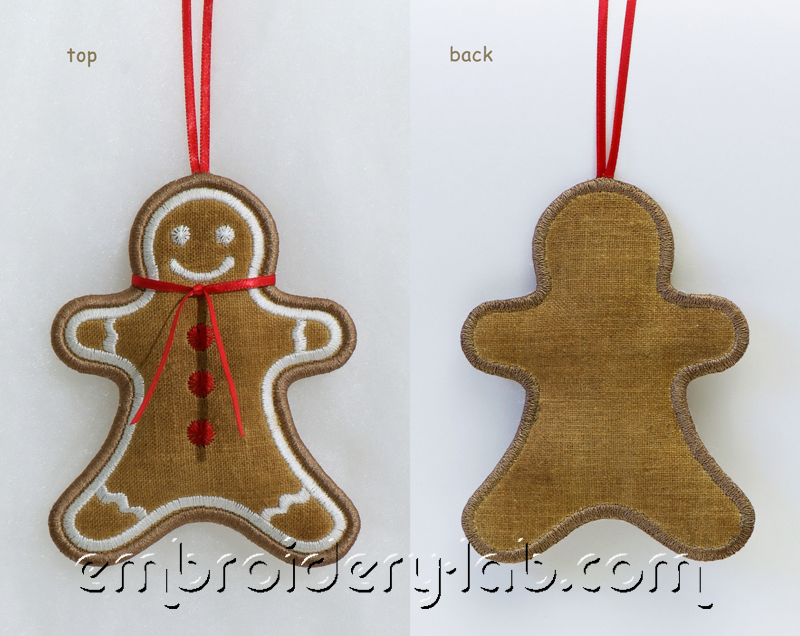 You can purchase Gingerbread Man 0001 hanging decoration digital embroidery design in our shop. Christmas is a very special day when you are waiting for something unusual to happen. 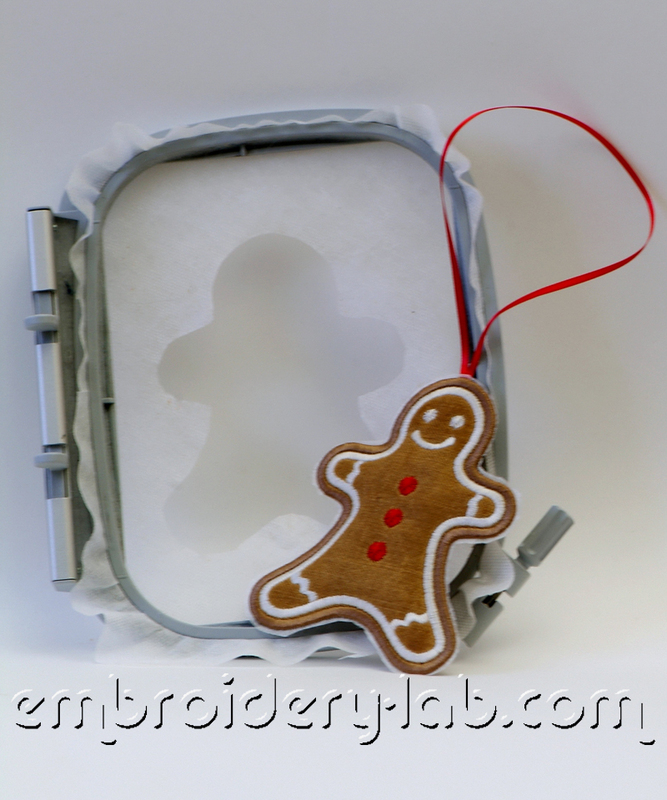 Let’s create a cookie with a special Christmas scent of vanilla and cinnamon. Instant coffee (the cheaper the better); cinnamon, vanilla, cocoa (optional). In 100 ml of hot water add 2 teaspoons of coffee, 2 teaspoons cocoa (you can do without it, just increase the dose of coffee), a pinch of cinnamon and vanilla. Grab a brush and “paint” the fabric with this solution (put polyethylene film under the fabric to keep your work surface safe). You can paint the fabric evenly, it is possible to paint some areas 2-3 times, they will be darker, so it’s up to your imagination. After painting, put some baking paper in a baking tray, place your fabric on it, then put the tray to the oven for about 15 minutes at the smallest temperature range (mine is 110° Celsius ). “Bake” the fabric for approximately 15 minutes. Do not leave it unattended and don’t forget to turn it over as if you were cooking real Christmas cookies! You can do without baking, but the colour will not last as long. You can iron the dried fabric over with steam instead. The fabric for the cookie is ready! Please note that this colour is not stable in contact with water, stains might appear on the fabric. The fabric that’s dyed this way can only be used for making interior decorations! 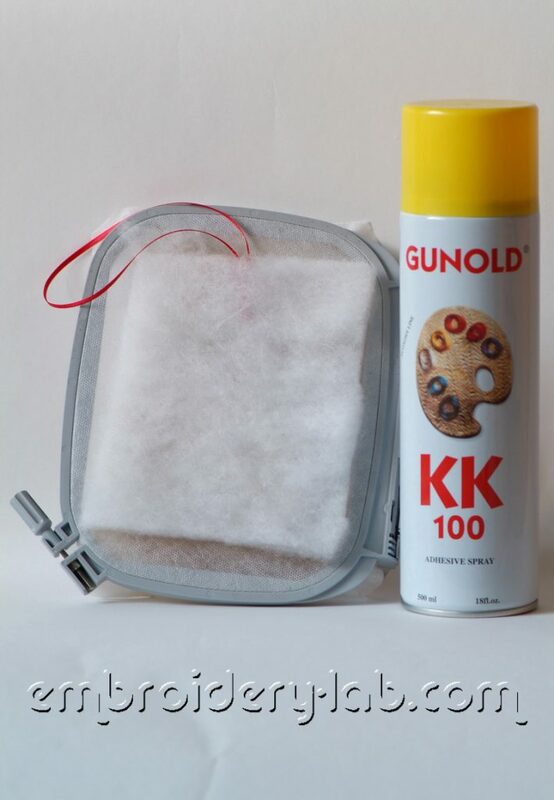 Temporary adhesive spray. Before start working test your temporary adhesive spray on your water-soluble stabilizer. 1. 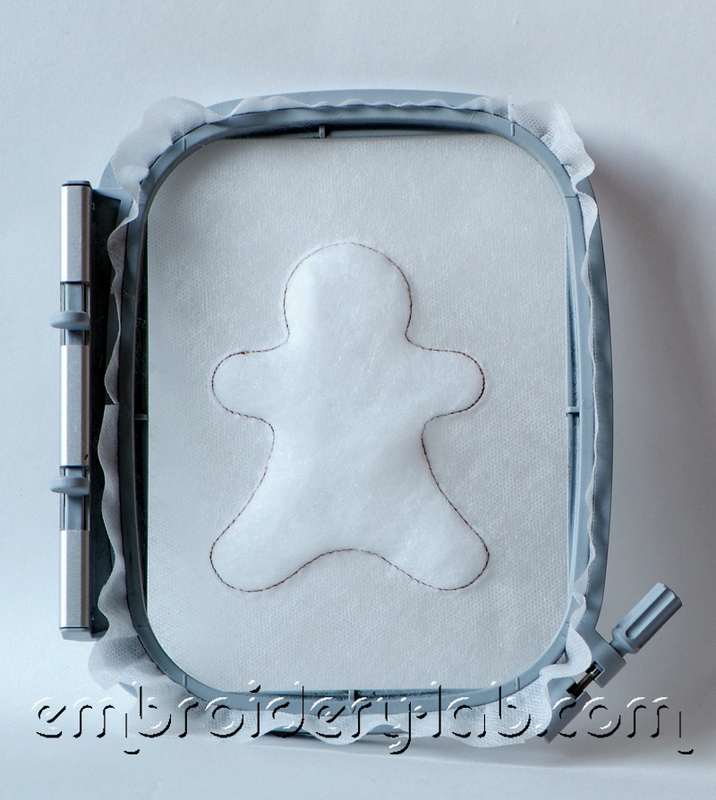 Hoop the water-soluble stabilizer and embroider the guidelines using running stitches – it’s colour number 1 (photo 3). 2. 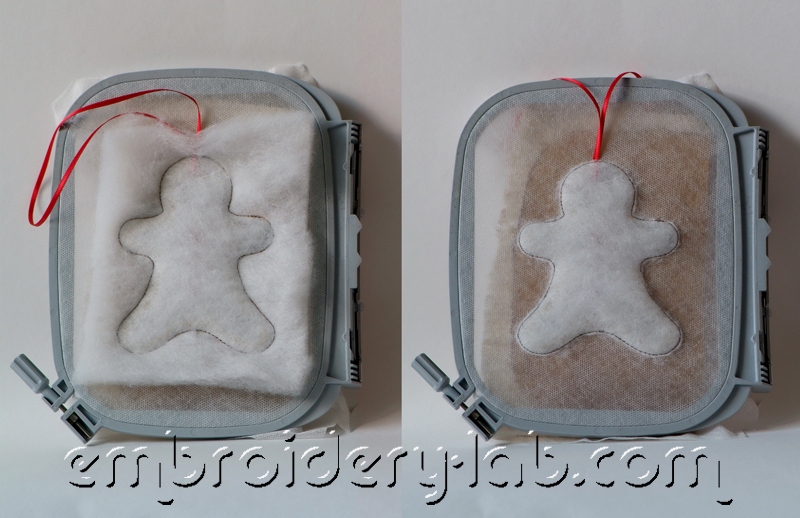 Put over the padding polyester then stitch it – colour number 2. 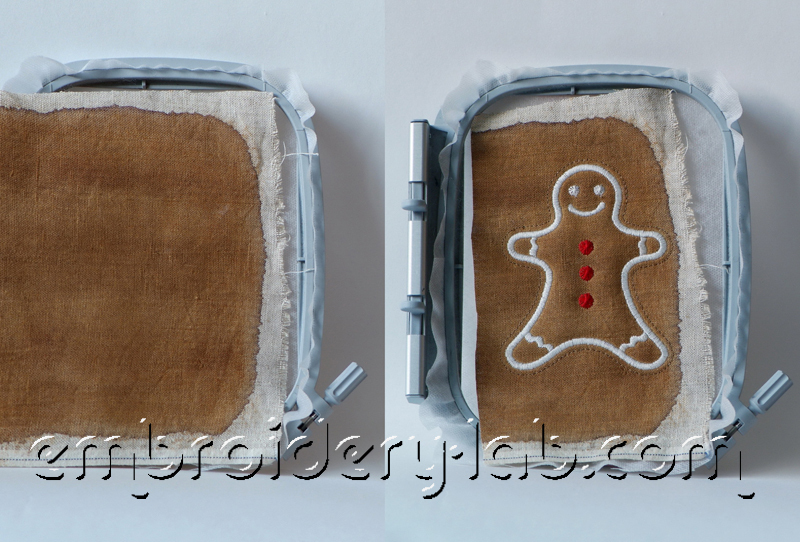 Cut away the excess padding polyester as close to the stitch as you can. CAREFUL: do not damage the stabilizer! (photo 4). 3. 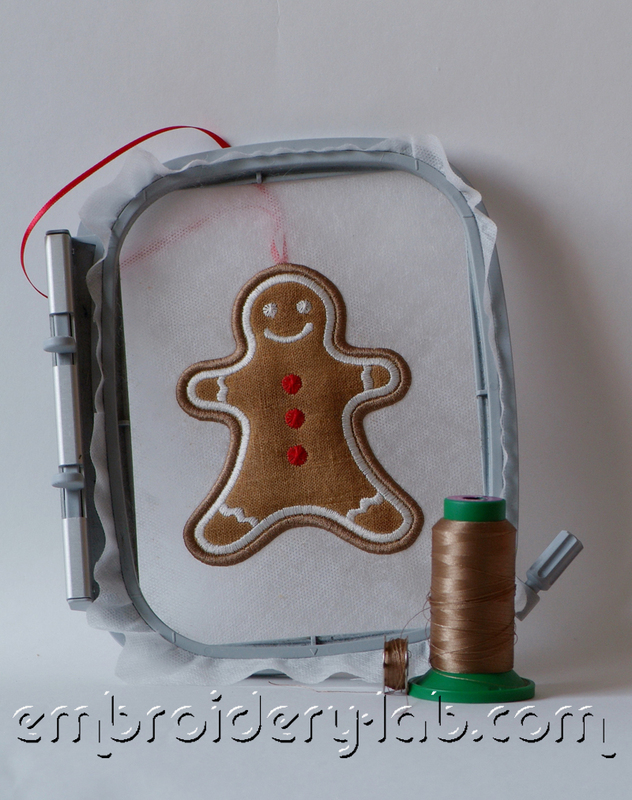 Put over a piece of fabric, stitch it further till you reach the zig-zag stitches – colour number 3, then embroider the ginger bread man– colours number 3, 4, 5 (photo 5). 4. Spray a shot of adhesive then fix the padding polyester and the lace on top of the design (photo 6). 5. Stitch around the edge – colour number 6. Then cut away the excess padding polyester close to the lines. BE CAREFUL: do not damage padding polyester and the lace (photo 7). 6. 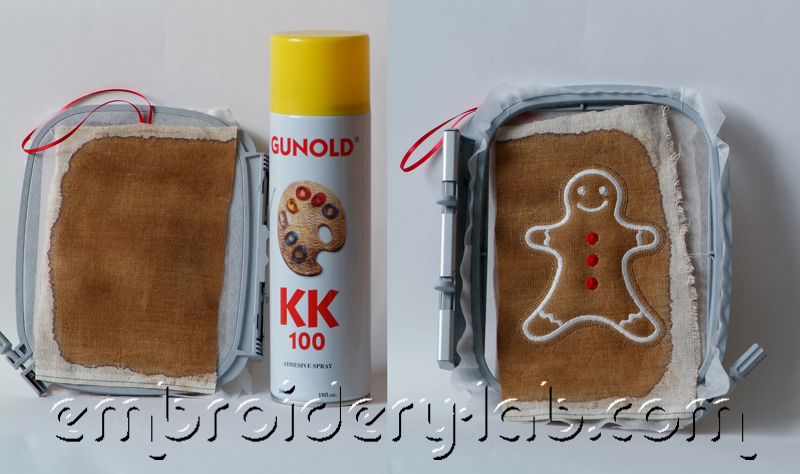 Spray a shot of adhesive on your fabric and stick it to the padding polyester. Then stitch it with zigzag stitches – colour 7 (photo 8), then cut away the excess fabric from both sides of the embroidery close to the line. BE CAREFUL: do not damage stabilizer and the lace (photo 9). 7. 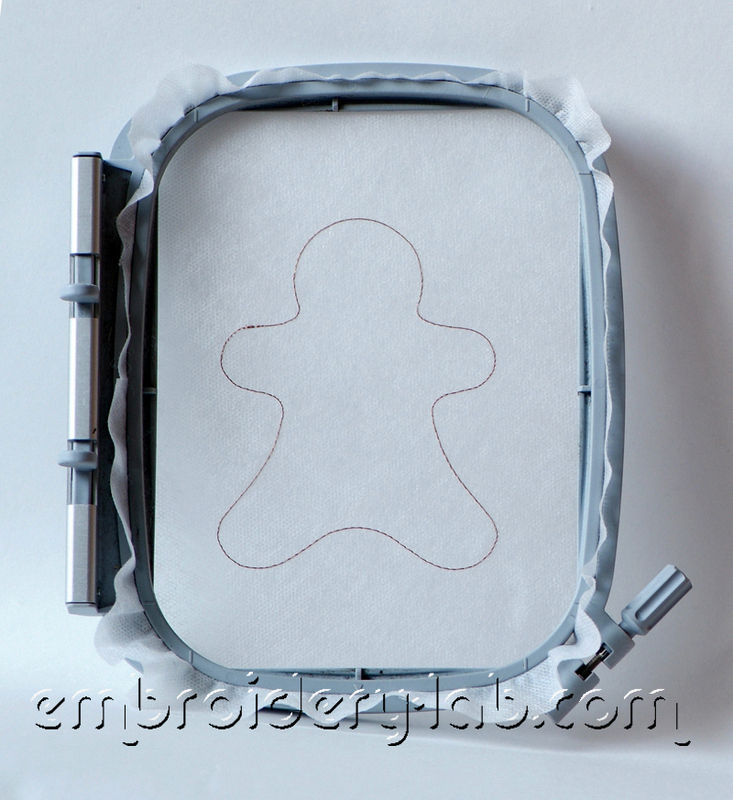 Embroider the rest of the design – colour 8. 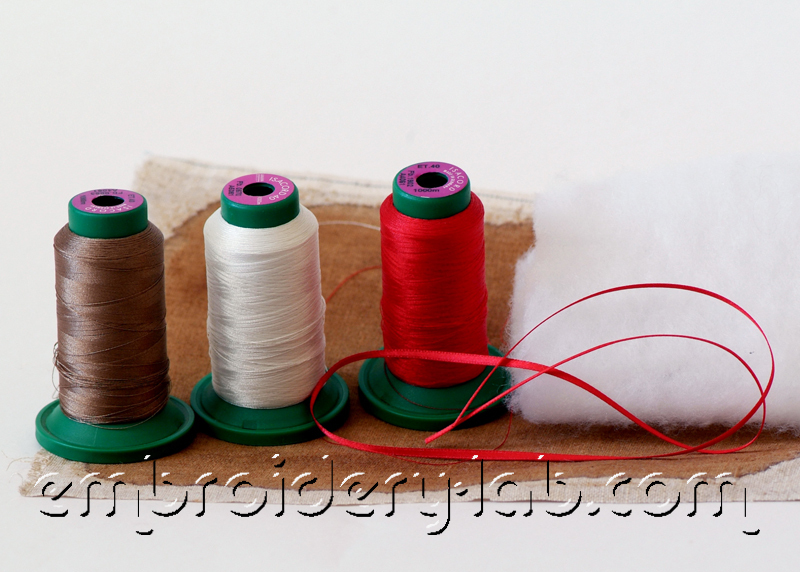 Wind the bobbins with the same color as the top thread (photo 10). 8. Cut away the excess stabilizer (photo 11). 9. You can remove the rest of thestabilizer carefully using water or wet towel. Avoid getting water on the fabric. 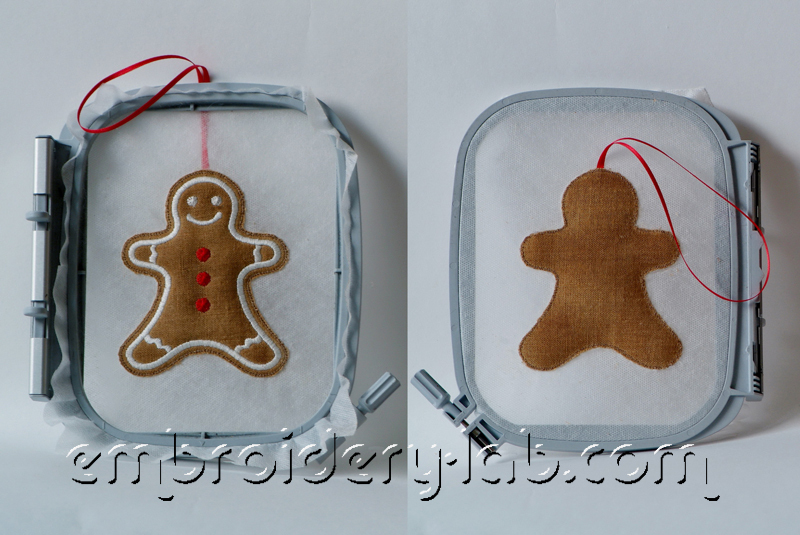 Your very own Gingerbread Man is ready! (photo 12). Additionally, you can rub the design with vanilla. Enjoy!